Many brands of cream cheese contain thickeners or gums; gum-free cream cheese is available at some specialty shops. Cream cheese is also available as a spread, flavored with herbs or peppers. The fat content of this cheese varies widely, from the high-fat German fresh double cream cheese to low-fat Quark, which has only about 5% fat. 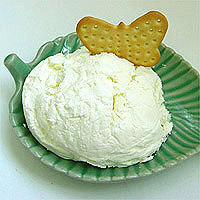 Reduced-fat cream cheeses are typically whipped and expanded with air. Some low-fat versions contain whey powder, which tends to alter the texture. Neufchâtel is a name used in the United States for a softer form of cream cheese that contains 20 to 33% fat, although the cheese bears no relationship to French Neufchâtel, produced only in Normandy. The best-known European varieties of cream-cheese type cheeses include Italian mascarpone, often used as the basis for sweet desserts, Austrian Quark, the French crème fraîche, and a broad range of herbed or flavored spreads, including goats’ milk cheeses like chèvre.